Pharma organizations are transforming at an incredibly high velocity as the competitive landscape continues to evolve. Yet most of the investment is doomed to sub-optimize. 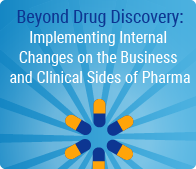 This informative White Paper provides a compelling business case for applying a repeatable process to managing the human side of non-drug discovery projects. If you are a leader, a project manager, or a core team member with accountability for implementing Pharma changes, this is must-reading!